January hiring aligned with expectations, but the government’s report also revealed sizable upward revisions to employment in 2011 and 2012, indicating that the employment market was more robust than originally reported. 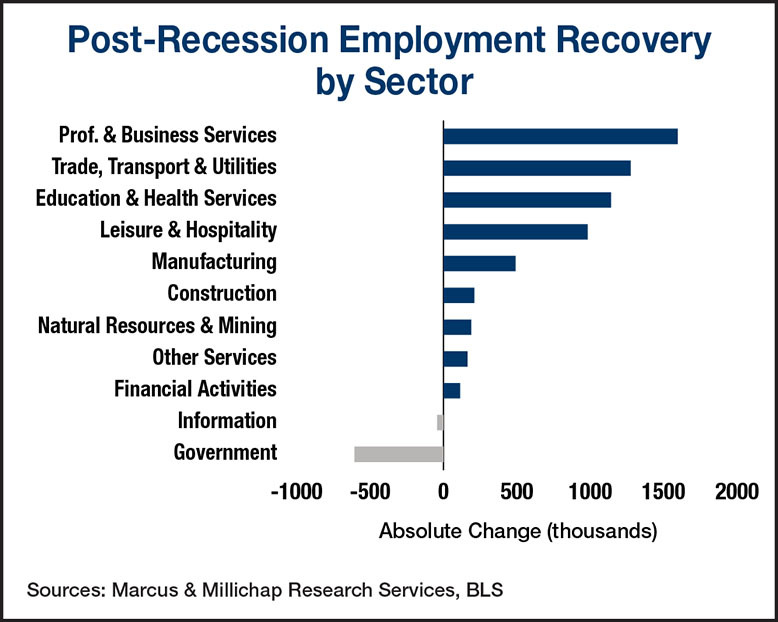 Recessionary employment losses totaled 8.7 million positions and, to date, 5.5 million jobs have been recovered. Hiring continues to gain traction, and if Washington can resolve its fiscal affairs and belay corporate uncertainty, job creation could accelerate significantly. Still, unemployment remains stubbornly high and under-employment remains near peak levels. Employers added 157,000 positions in January, including 166,000 new hires in the private sector. The most significant news in the report, however, was the upward revisions of 2012 hirings by 335,000 jobs to nearly 2.2 million, and an addition of 263,000 jobs in the prior year to a total of 2.1 million. The restatements indicate that the labor market is recovering more quickly than originally reported and also reinforces other positive economic trends, including rising corporate profits and a nascent recovery in the housing sector. Employers, however, may continue to act cautiously in early 2013 after the government set up another potential showdown over the debt ceiling and delayed the implementation of spending cuts. The largest restatement of 2012 trends occurred in the trade, transportation and utilities employment sector with an upward revision of 145,000 jobs. A 4.7 percent increase in retail sales and additional store openings resulted in the hiring of 66,000 more retail workers than had been previously reported. Wholesale trade also added more workers, while more hookups for residential service supported a gain of 151,000 transportation and utilities workers. An additional 73,000 construction jobs were also created in 2012, reflecting an increase in single- and multifamily building in the second half of the year. Many residential construction trades, including framing, painting and electrical work, added workers during the period and accounted for the largest revisions in construction employment for the entire year. While the building trades expanded in the fourth quarter to staff new projects, national apartment vacancy declined 20 basis points to end the year at 4.5 percent. Construction started on 246,000 for-sale and rental multi-family units last year, a 38 percent jump from 2011, and permits also increased substantially, portending greater construction output in 2013. An acceleration of building marks a transition to a new phase for the apartment market, as completions will increase to 145,000 units in 2013 from roughly 85,000 last year. However, continuing household formation by echo boomers and growing preferences for renting over ownership will sustain demand slightly ahead of supply growth, resulting in a 10-basis point drop in nationwide vacancy to 4.3 percent. Full-time office-using positions were revised upward by 85,000 jobs for 2012, taking last year’s total to 464,000. Nevertheless, healthy growth in office-using employment sectors has yet to translate to meaningful net absorption. Only 17 million square feet of net absorption was recorded last year, generating a 30-basis point drop in vacancy. Minimal construction and more robust demand growth, however, will cut vacancy 90 basis points in 2013 to 16.2 percent. This entry was written by marcusmillichap, posted on February 1, 2013 at 11:40 pm, filed under Research and tagged Commercial Real Estate. Bookmark the permalink. Follow any comments here with the RSS feed for this post. Post a comment or leave a trackback: Trackback URL.